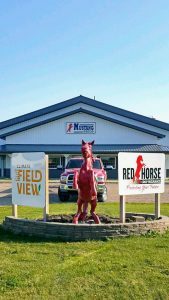 Ada, MN, September 14, 2018– Mustang Seeds, a family owned independent seed company based in Madison, SD is proud to announce a new location to open in Ada on September 19. The press and city are invited to the grand opening of Mustang Seeds on September 19. The event will take place at 903 West 1st Ave. S in Ada between 5:00 P.M. and 9:00 P.M. Guests will be treated to free food and prizes and the opportunity to meet with Mustang Seeds staff and President, Terry Schultz. The seed company has been supporting area farmers for several years and the new location will allow the opportunity to continue growing their area footprint. Mustang Seeds was founded over 55 years ago and has over 200 dealers positioned throughout their trade territory of Minnesota, South Dakota, Iowa, Nebraska, and North Dakota. More information on the company can be found at mustangseeds.com or by contacting the local Mustang Seeds district sales managers Jay Merkens at 218-415-0987 or Scott Erickson at 218-368-5314.